ALL MY GLUTEN FREE PEEPS STAND UP! YAY! 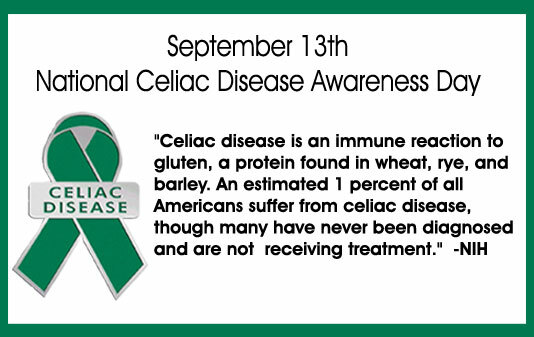 Happy Celiac Awareness Day everyone! I’ll be celebrating Celiac Awareness Day with some baked turkey meat balls, some fried plantain (my all time favorite food…seriously I could eat fried plantain all day everyday – Ghanaian style) and baked sweet potato slices with rosemary. OH and you can’t forget dessert! BROWNIES! If you haven’t tried King Arthur Flours Gluten Free Brownie mix TRY IT! SO GOOD! Top it of with a scoop of Cold-Brewed Cinnamon Coffee Ice Cream from Steve’s Ice Cream (that flavor is gluten free and vegan) and you are set! Finding a gluten free cafe is like finding a four leaf clover. You definitely want to hold on to it. 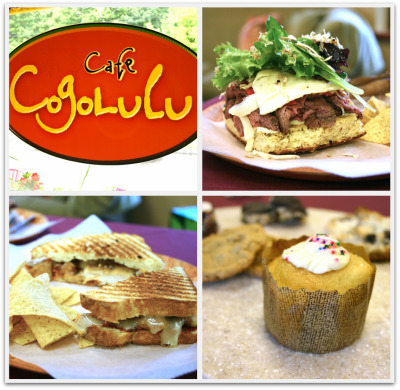 Cafe Cogolulu in Wilton, Connecticut is definitely a gem. My boyfriend actually found this cafe through some browsing and we finally had an opportunity to visit there today and I know I will definitely be going back! 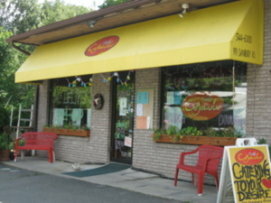 Located on Danbury Road in Wilton, Cafe Cogolulu is an all gluten-free all time time cafe. Their website homepage states “Cafe Cogolulu, where everything that tastes good is really good for you. Let your imagination run “free”, Gluten Free, Dairy Free, or Guilt Free…We take the fear out of dining”, and they surely do. They have a great menu of breakfast sandwiches, sandwiches, paninis and desserts including cupcakes and gelato. They also cater! They can even make custom cakes and other baked goods to suit all dietary restrictions available to order. Just give them a call. I tried their “IL LIDO” hot sandwich which is grilled rosemary chicken topped with spinach, sundried tomatoes, and Fontina cheese. (I got it without the sundried tomatoes and fontina cheese) and I got it on garbanzo bean & potato foccacia (you can also choose to get it on their traditional gluten free white bread). It was delicious! The chicken was tender and flavorful and the spinach leaves added just the right amount of crunch. The bread was also good which I am VERY picky about and I really enjoyed it. I also tried a chocolate cupcakes with vanilla frosting which was also good. It is a very thick chocolate cake that you can definitely split in two and enjoy it twice! 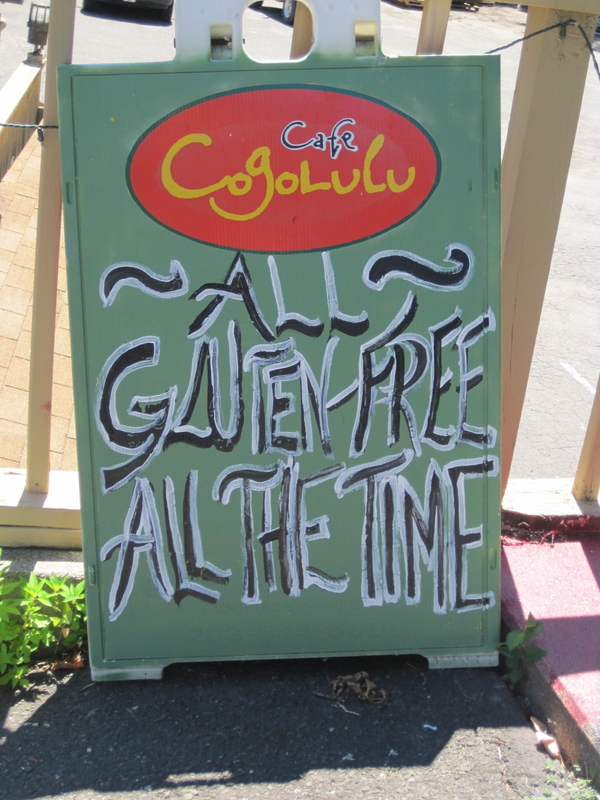 I definitely recommend Cafe Cogolulu to anyone looking for a gluten-free cafe in Connecticut and cannot wait to head back there again. I love to bake. Cookies, cakes, pies you name it, I wanna bake and eat it! However, becoming gluten-free halted my baking for a while because I was not sure which flours were the best gluten-free flours, if I could find proper and tasty substitutes for ingredients found in normal cakes or if the new gluten-free desserts would taste just as good if not better than the ones that do contain wheat. My boyfriend purchased me an AMAZING cookbook by Carol Fenster titled 1,000 Gluten-Free Recipes that has been a fantastic guide for all my baking needs. There are more than just pies, cookies and cakes in the recipe book. From breakfast creations, to appetizers, snacks, seafood and meats, 1,000 Gluten-Free Recipes has it all. Here is just one of 1,000 recipes (with a little tweaking by myself to also make it dairy free). Make the pudding: In a medium saucepan, stir together the sugar, cornstarch, and salt until thoroughly blended. Add the rice milk and cook over medium heat, stirring constantly, until mixture thickens. Remove from the heat and stir in the vanilla. Lay a piece of plastic wrap directly on the pudding and refrigerate for at least 3 hours. Place a rack in the middle of the oven. Preheat the oven to 325 F. Generously grease two 8 inch round nonstick (gray, not black) cake pans and line the bottoms with parchment paper or wax paper. Generously grease the pans again; set aside. Make the layers: in a large mixing bowl, beat the canola oil with the sugar until smooth. Add the eggs, one at a time, beating well after each addition. In another bowl, sift together the gluten-free baking flour, xanthan gum, salt, baking powder, and baking soda. In a measuring cup, whisk together the rice (or soy or almond) milk, vanilla extract, and almost extract. Beat the flour mixture into the egg mixture until smooth. Spread the batter evenly in the pans. Bake 20 to 25 minutes or until the tops of the cakes are golden brown and a toothpick inserted into the center of the cake comes out clean. Cool the cakes in the pans 10 minutes on a wire rack. Remove cakes from the pans with a thin metal spatula, discard the paper, and cool completely on the wire rack. Make the ganache: Place the chopped chocolate in a heatproof bowl. Heat the milk to boiling the pour over the chocolate. Let stand about 3 minutes the stir until smooth. Immediately proceed to assembling the cake before the chocolate hardens. To assemble the cake, place one cake layer, topside down, on a serving plate. Spread the vanilla pudding on top. Place the second layer on top, topside up. Drizzle the chocolate ganache over the top of the cake and spread it to the edges, letting a little run over the sides, if desired. Serve immediately before the chocolate hardens. Refrigerate leftovers. It’s the middle of November which means the days are getting shorter and the nights are getting colder. There was snow in October! It’s the perfect time to enjoy a pipping cup of tea. But not ALL teas are gluten-free. Most of them are but unless it is clearly stated on the box or in the ingredients, one can never be to sure. There are a few companies that are gluten-free and Bigelow is one of them. Bigelow teas are NATURALLY gluten-free (with a few exceptions, which are clearly labeled whether they are gluten-free or not on the box). I am a huge fan of the Bigelow brand because they have a variety of flavors and types of teas. From various Breakfast Teas and Early Grey Teas to lemon, raspberry, orange and delicious seasonal flavors, Bigelow has something for everyone.